The United States Department of Agriculture and the Environmental Protection Agency recently announced national goals last year to reduce food waste. Setting the mark at a 50 percent reduction by 2030, the agencies stressed the staggering costs of discarded food. Nationally, an estimated 40 percent of food is thrown away, amounting to losses over $160 billion. Food waste affects food security, natural resources and climate change. With one in six Americans lacking access to a consistent, nutritional supply of food and the considerable amounts of energy, land and water used to produce food that is thrown into landfills, strategies need to be implemented to minimize waste. Students Caitlin Garvey (CLAS) and Megan Reiser (CAHNR) help glean blueberries left in the field after pick-your-own season at Scantic Valley Farm for the Tasty Waste Lunch event. Heeding this call, the College of Agriculture, Health and Natural Resources (CAHNR) partnered with the Department of Dining Services and a number of other UConn departments and organizations for Huskies Ending Food Waste to raise awareness and effect change to reduce food waste on and off campus through four events this semester. CAHNR collaborated with Community Outreach, the Office of the Provost and the Office of Public Engagement. Other major sponsors of this initiative, the Connecticut Farm Bureau, United Technologies and Foodshare, provided funding support and participated in guest lectures for this Food Waste Series. Cameron Faustman, associate dean for Academic Programs in CAHNR, helped organize Huskies Ending Food Waste with Jillian Ives. Ives is an academic advisor and program advisor for the College Ambassadors in CAHNR. Faustman kicked off the first event of the series, Close to Home: Connecticut Food-Based Efforts to Reduce Food Waste on September 13. Speakers detailed the causes of food waste and local endeavors to combat it. Margaret Chatey, director of marketing and communications with the Connecticut Farm Bureau, pointed to the role of consumer preferences when purchasing fruits and vegetables. Those that do not meet our aesthetic standards are often passed over by buyers and thrown away by vendors. Farms sort out these unappealing crops before they even reach consumers, using them for compost, to produce other goods or donating them directly to food banks. Foodshare, a food bank that serves Hartford and Tolland counties, accepts farm contributions to help feed 137,000 Connecticut residents. CEO James Arena-DeRosa spoke about Foodshare’s assistance to many seniors and children, acknowledging that those demographics often struggle with food insecurity. While numerous organizations welcome donations, many businesses are reluctant to give leftover food to charitable causes. State laws or company policies may mandate the discarding of food that is still safe for consumption. This is attributable to the inclusion of expiration and sell-by dates marked on food labels. Christine Rice, a clinical fellow at Harvard Law School’s Food Law and Policy Clinic, noted that though most labels relate to quality only and not safety concerns, studies show over 90 percent of Americans discard edible food because of these date labels. The variation in labeling practices and confusion surrounding their meanings leads grocery stores, restaurants and consumers to unnecessarily throw away edible food. Connecticut Senator Richard Blumenthal recently introduced the Food Date Labeling Act in an effort to clarify language and educate consumers in order to mitigate this source of food waste. Students at the Tasty Waste Lunch. Dennis Pierce, executive director of Dining Services at UConn, explained how UConn employs software programs to minimize food waste on campus. These programs help prevent overbuying by tracking purchases and consumption. Pierce and Rob Landolphi, culinary operations manager, collaborated with CAHNR in coordinating local farms and companies to host the Tasty Waste Lunch the following week as a part of the Food Waste Series. 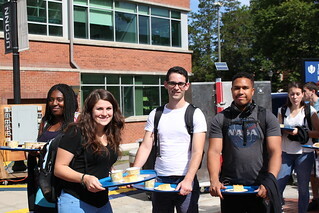 This helped to highlight the efforts of Dining Services to fight waste on campus and drew students’ attention to the issue by providing a free buffet-style lunch on September 21 made from food destined for the trash. The event was a resounding success, feeding over 1,200 people. The lunch took place on Fairfield Way and featured southwestern Chili, Brunswick stew, a provençal vegetable soup, corn bread and blueberry bread pudding with ice cream. 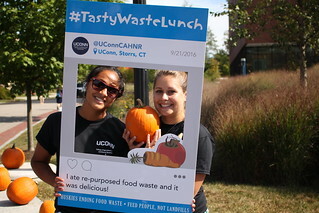 Students helped promote the Food Waste Series on social media. While the panel discussion and Tasty Waste Lunch focused on regional initiatives, two segments of the Food Waste Series turned to environmental impacts and global efforts at reducing food waste. John Mandyck, chief sustainability officer for United Technologies, spoke to the need for greater efficiency in the production and distribution of food in his talk, Sustainable Urbanization: The Future of Food. Mandyck, the co-author of Food Foolish, noted that overproduction is a major source of waste. Land, water and other resources are spent unnecessarily and contribute to greenhouse gases. Despite excessive output, hundreds of millions face hunger across the globe. Increased production efficiency is essential and the delivery of food requires refinement. He noted that cities are growing and their populations are going to be further removed from food sources, so there is a pressing need to address urbanization and sustainability. This international perspective on food waste will be the subject of the last event in the series. Claire Kneller, senior business development manager, and David Rogers, a project manager, of the Waste and Resources Action Programme (WRAP) will discuss their organization’s efforts in the United Kingdom to improve sustainability and effectively manage resources on November 15 at 4:00 p.m. in the Andre Schenker Lecture Hall. WRAP’s Love Food, Hate Waste program is well known globally. WRAP helps governments, businesses and communities, promoting the minimization of waste through cycle initiatives and by changing business and consumer habits. This entry was posted in Food, Nutrition, Students.